The platen is removable. More photos at my Flickr page. I’ve begun to restore a Fay-Sho No. 7 that I lately acquired on eBay. To be honest, I’ve never restored a typewriter before (save unsticking a few keys or replacing a some screws), but I’m working slowly and carefully, and do not expect to bring any great harm to the machine. The typewriter, featuring an eagle emblem on the paper table, is complete and even functional. All keys strike, and the carriage would advance if the leather belt was not so deteriorated. Except that the typewriter had been stored in a outbuilding for (decades? ), it probably would be in better working order. Or not. I suppose had this been kept elsewhere, poked at, or moved frequently, it might not be in such decent condition. Who knows? Platen is rock hard and cracked. Feed rollers are hard and malformed. Ribbon is worn and dry. Leather belt that advances carriage is brittle and disconnected at one end (the end that attaches to the carriage, I suppose). The mainspring in good working order. Some rust, not much, on various elements. Typewriter seems complete, no missing parts. The paper table is interesting, as the model number is not stamped on it; instead, it displays an eagle emblem (the fine print in the border of emblem reads: “Made in U.S.A.” & “New York Export and Import”). The text on base is faded and illegible. 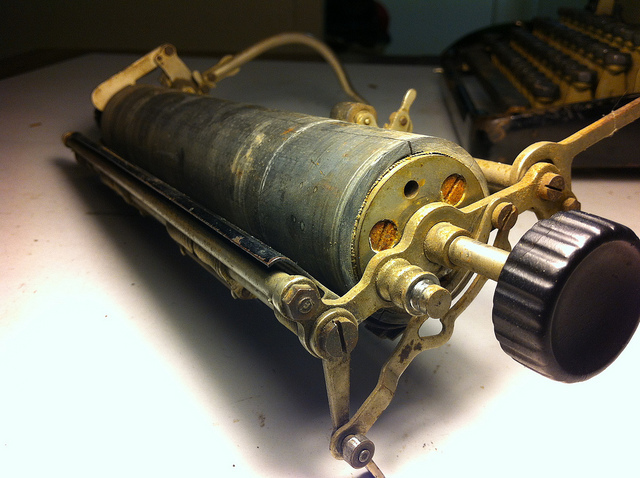 Thus far, I’ve cleaned the external parts of the typewriter and some of its internal workings. I’ve disassembled the carriage assembly, which is simple enough, and have begun to clean each part. From what I’ve read, the Fay-Sho features a number of improvements over the Remington models, which it closely resembles. I would have to agree. The platen is removable and each part of the typewriter fits intuitively. Some pieces are even labeled (e.g. “front” and “rear”). As I’ve been working, I’ve discovered a number stamped onto the top of the frame, under the carriage assembly. Two rows of numbers read “22” and “828” — not sure the significance of these numbers. Under the top of the typewriter, I found the serial number: “805” alongside a stray “7” (model number?). I doubt that I will disassemble anything below the carriage assembly, especially as there is ready access to the internal workings through the sides and top. The unit is far more complex below the carriage assembly too. As I progress, I will probably have a new leather belt crafted, though I’m not sure where one end connects. The belt is about 7 inches long (perhaps a section is missing). Also, I’ve begun to get estimates for a new platen and rollers. The platen is 9 1/2 inches (240mm) long. The bottom feed rollers are 1 3/5 inches (40mm) and the top feed rollers are 3/8 inch (10mm) long. Why am I restoring this old typewriter? First, I haven’t decided how extensive the restoration will be — I may be satisfied with a simple cleaning of the machine. Second, I think it is time for me to undertake a mechanical project. Most of my endeavors have been intellectual; in truth, I rarely work with my hands (and, when I do, not very competently). My landlord, a retired mechanical engineer with International Business Machines, is providing encouragement and advice, and if I proceed slowly enough, and carefully enough, the worst that will happen is that I’ll have a partially restored Fay-Sho No. 7. Not a bad goal. Yet, there is another reason: Inexplicably, I feel compelled to bring this machine to working order. It seems close enough to operating condition to merit restoration, even by one so inexperienced, and not so damaged as to cause dispair. If I am successful at this project, I will undertake others. There is a Royal Standard No. 5 in my collection needing restoration. One last note, any encouragement or advice would be appreciated. I look forward to seeing your progress. It sounds like the typewriter is in pretty good shape and I bet you will have success. Your Royal 5 is considerably more common, so you might try some techniques on it first before trying them on the Fay-Sho if you have any doubts. The Fay-Sho, I think, is not based on Remington designs — it just has a superficial similarity. (In fact, Remington sued the company over its old name, Remington-Sholes. If there had been any real similarity of mechanism, they would have sued them for patent infringement too.) One improvement over Remingtons is that Fay-Sholes use a typebasket shift instead of carriage shift (quite unusual and innovative for blind writers). Thanks, Richard, for the clarification regarding the Sholes-Remington dispute. Also, I am impressed by your restoration projects and will read them a little more carefully soon. Could you recommend a site offering general information about typewriter restoration? I’ll probably stick with the Fay-Sho project as opposed the Royal No. 5 project, namely because it seems that the Fay-Sho needs mainly a good cleaning. The Royal No. 5 that I own probably needs some mechanical work, which is why I’m holding that in second place. But we’ll see. Thanks for commenting, and thanks for the links.